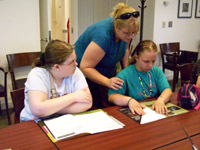 Project Overview: Students spend the week experiencing many facets of career exploration. Rationale: Children who are blind benefit from exploring career interests, developing future goals, and learning about and observing specific career choices. The goal for day two was to learn more about the students’ top three careers, and more specifically to find a mentor who works in that field and who also has a visual impairment. Mentors were located through the career connect website and emails were sent directly to them through the web site. The students wrote letters to mentors asking a variety of questions about the career itself as well as how the mentor has adapted to working in that career with a visual impairment. By the end of the week, most of the children had already received responses from their mentors. In order to contact a mentor the children had to register with Career Connect, which provided a great opportunity for some technology training. On day three we shifted the focus to job applications and resumes. A “field trip” into the community gave the students an opportunity to visit several different businesses and request job applications. For many this was an important step towards independence. Back at the agency we compared the various applications. Volunteers acted as “job coaches” to help each student fill out an application. The next topic was resumes. We discussed the differences between a job application and a resume and the reasons an employer may want one or the other from an applicant. Then the students created a basic resume with the help of their job coach. Interviewing was the topic for day four. We discussed appropriate attire for an interview, disability disclosure when applying for a job, and some common interview questions. The students enjoyed a humorous skit put on by staff members that showed the “do’s and don’ts” of interviewing, followed by a group discussion. The final activity for the day was a mock-interview. Several local business owners/managers volunteered to come to the agency and conduct interviews with the students. Each student brought a copy of their resume into their interview. Afterwards the interviewer provided some feedback to the student. The final day of the camp gave the students a chance to visit a local college/university. Over the years we’ve visited many different schools. 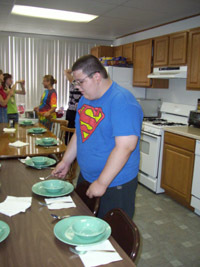 During these visits it is important to include a campus tour as well as a meeting with the person who is in charge of coordinating disability services so the students can learn more about what kind of accommodations they might expect if they were to become a student at this college/university. If there are currently students at the college/university who are blind or visually impaired, you can also request ahead of time that they come and meet with the kids as well. This college visit can actually be done on any day of the camp, depending on scheduling needs. Some colleges will even allow your group to stay overnight in a dormitory, which is a wonderful opportunity to get the students excited about going to college as well as provide them with valuable social and recreational time with their peers. Another important activity that can be done throughout the week is to visit blind or visually impaired professionals at their work place. You can usually find out about these individuals through your local blind association. Contact them ahead of time to find out if they’d be willing to let the group visit them at work or if they’d prefer to come to the agency to speak with the students. This is a very valuable experience for the students, because it allows them to see first-hand that individuals who are blind or visually impaired can compete and be successful in the work force. Result: By the end of the week, each student had a better idea of what careers they would like to pursue and a greater knowledge about what each career entails. 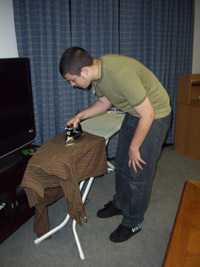 They also had completed job applications and resumes, which they can refer to as they apply for jobs in the future. As members of the Career Connect web site, the students can now stay in touch with their mentors and continue to explore the other resources the website offers. Finally, the students participated in many real-world experiences (interviews, college visits, work place visits, etc. ), which provided valuable concept development as well as fostering greater self-confidence and independence. Register with Career Connect (www.careerconnect.org) and take some time to explore the site so you will be prepared to work with the students. Contact individuals to conduct mock interviews. Ideally, these would be people who interview applicants as part of their job. Contact a local job counseling center to see if they have someone who can come as a guest speaker. Arrange for a college visit. Inquire about staying overnight in a dorm. Set up a meeting with the director of disability services for the college as well as a campus tour. Set up some work-site visits to people who are blind and visually impaired. Plan your meals for the week. You can eat out, bring food in, or involve students in the planning and preparing of meals. I usually put the students onto “teams” with each team in charge of planning, shopping for, preparing and cleaning up after one meal.